Visec® (http://www.visec.com), creator of the Visec surveillance software suite and the License Plate Recognition Cloud Network in South Africa (LPR CLOUD SA) announces that it has developed and manufactured the Visec GPS Server, a standalone network embedded hardware device that provides real time GPS data location and GPS time logs. The innovative product offers a low-cost solution for GPS tracking and is easily accessible with a web client based on the standard client web server architecture. "We originally developed the Visec GPS Server to be used exclusively for our Visec License Plate Recognition (LPR) Cloud Network in South Africa," says Gary Scagell, CEO of Visec. "However, during beta testing we received multiple requests from 3rd party integrators for adoption and based on this demand, we have now made the technology available to the public." 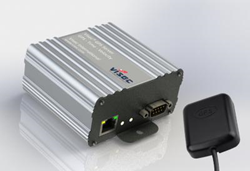 The Visec GPS Server was engineered to be easy to use, support seamless 3rd party integrations, provide extreme positioning accuracy, utilize low power consumption, display LED status indicators, have extreme portability for mobile application and be durable by being incased in a shock resistant metal chassis. "The Visec GPS Server provides another example of the innovation at Visec," says Jason K. Bordbar, MBA, Senior VP of Sales and Marketing, Visec USA Division. "Not only was this product manufactured in house, the research and development was based on a collaborative effort of all stakeholders to ensure proper technological alignment and ultimately maximize ROI." MSRP is R6,750 (ZAR- South African Rand) approximately $499 (USD- United States Dollars). Visec created the first LPR CLOUD South Africa (LPRCLOUDSA) that currently has hundreds of millions of recurring instances of license plates within South Africa. Current approved users of this LRP CLOUD include numerous South African Police Service (SAPS) members, Directorate for Priority Crime Investigation (Hawks), National Prosecuting Authority (NPA), South African National Parks (SAN Parks), City Councils, Metro Police, Law Enforcement, Approved Neighborhood Watch Operations Managers, Border Control, Cash-in-Transit and Car Rental Risk Investigators. The LPRCLOUDSA was created, funded and its critical use donated to SAP's Custodians by Visec. Visec made this powerful technology for the well-being and safety of all South Africans. To accomplish this task, Visec invested years of work, millions of Rands, and countless consultation from security professionals, and police officers. The result is a state of the art (and only) African LPR cloud. Visec continues to maintain the LPR Cloud with an expert technical team and sophisticated technology infrastructure.